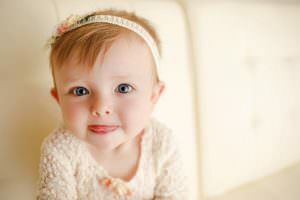 You all know I offer San Diego Baby Photography but did you know that adorable baby portraits aren’t limited to baby’s first month? I have absolutely fallen in love with these sitter sessions! I love this age when baby is still teeny tiny but also starting to grow into her personality with lots of cute expressions and fun skills to show off for the camera. Sitter sessions are traditionally thought of as “6 month” sessions but I find they are absolutely perfect a little closer to 7-9 months when baby is sitting independently for long periods of time without toppling over. I provide all of the props, backdrops, and even adorable outfits necessary to create my signature look for these classic sitter sessions. You bring your adorable baby and I bring the rest! This session was extra special because I was able to document baby’s growth for a family I did maternity and newborn photos for last year! There is nothing like the wonder of watching a baby grow throughout the first year of life…so much changes so fast and it always amazes me! 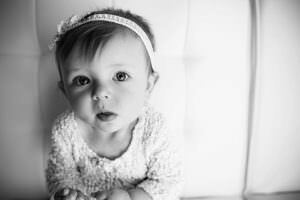 I hope you enjoy this adorable session featuring a gorgeous baby girl and a gorgeous romper from Pooks & Lulu.